Welcome to Diego's Corner! Diego is Rocky Hill SC's current Director of Strength & Fitness. Thoughout the season Diego's Corner will be updated with new information for RHSC players and parents. I hope the summer has been treating you very well with all of the wonderful weather and long days! I deliver this message, as our final month of summer is with us, to ensure that you are setting up your young athletes for success in their fall season. Success is many things to many people although one clear and important responsibility I have is to ensure that all athletes move through the season with limited injuries, quick recovery times for those injuries, as well as being as fit and flexible as possible. So how do we make that happens with only 3-4 weeks left? Read on! N.E.A.T. stands for Non Exercise Activity Thermogenesis which is simply the activities that we do that move the body but aren't calculated often as exercise. Examples are standing while working, reaching your step goals throughout the day, taking the stairs, dancing, carrying groceries/laundry, or even doing sit-ups during commercials. This will increase your activity levels which has been proven to improve mood, mobility, and overall health. Can everyone benefit from walking? Yes. Can we benefit more from running? Yes but we might not be in running shape. So one of the best ways to get more activity and exercise in our lives is to go for a walk/run combo every day. Find challenging routes with hills. Go with your dog or a friend and challenge each other. Don't make the first day of soccer the first day you run! Not sure what a tabata is, click here! and you will find one great way to that I love getting parents to work out with their kids! Make child's bedroom conducive to sleep - dark, cool, and quiet. Keep TV, computers, and phones out of bedroom. To provide more insight on this information, the amount of sleep a person generally needs varies but 7-9 hours. Add on the fact that we have young athletes and that number needs to increase. If you aren't sleeping and your results are suffering, start to make a better effort. Technology should also be put away far before the eyes close. As for caffeine, this is an entirely other story as there are studies that show caffeine has a dramatically positive impact to the body even of young people but the studies are too mixed to provide any personal opinion yet. Make sure that your child is getting back into their fall sport. Watch videos of highlights, get outside and play, and definitely make sure your cleats still fit. As usual, I am here for a resource should you need it. Be wonderful, stay happy, and work hard! Rocky Hill Soccer families, friends, and fans! Spring season is here, practices are scheduled, and we are ready to roll into busy weeks and weekends wrapped around the love of the game of soccer. So how exactly do we get into the season? What is the right way? Let's get into it! The toughest coaches will throw their athletes out into a challenge week of running and overall very difficult work. Although far too common, this is not the ideal way to treat kids to get them conditioned. Most athletes did not spend the winter running distances or going through such rigorous activity even if they were in another sport. Tough basketball or indoor track training is not similar enough to soccer. As coaches, trainers, and parents, it is important to know that we need to get the kids back into the sport with a pace that reflects their fitness levels. We do know it is better to spend the winter running and strength training but, for those that didn't do this, we have to move carefully to avoid serious injury that can eliminate our youth from their sport for a number of weeks while they recover. How do coaches fix this? Split the team into two groups the first week and have your athletes decide where they want to be. A well-conditioned group and a developing group. Avoid negative terms like "fit group" and "unfit group". This way kids know the purpose is progress, not to have a tag. Start with running with the ball around the yard. Get your touches back. Give yourself a goal: 10 juggles in a row. 10 perfect passes with a friend. Etc. If you challenge yourself daily, you will not only get back to soccer quicker but you will also likely improve your skills! Some coaches follow a more antiquated form of warming up. One lap around the field, sit in a circle, stretch each muscle to a count of 10. But we know we, as adults, need to stretch some things more and other things not as much. Our kids also need personal stretching!! As a strength coach and trainer, I suggest we take a look at top level professional team and how they warm up. Every player is out on the field concentrating on their type of play, position, and warming up injuries or tighter muscles. A goalie will be warming up their upper body more. A forward will be working on shorter and longer sprints. Defense will stretch their hips for all the side-to-side movement they will do. And so on. Decades ago I started working with my athletes with a warm up process I call "A-Z". You start from one end of the body and move all the way up. -First, get the blood moving, heart pumping, and you should start sweating. -From there, check your feet, ankles, lower calf, around the knees, quads, etc. All the way up and making sure not to skip an area. -Warm up even further after this and stretch again. -Please make sure to never stretch statically (hold stretches) until you are warmed up as this can magnify injuries, slow recovery, and be counterproductive. Be safe, move smart, and have as much fun as possible. Enjoy spring and be sure to say hi when you see me on the field!! If there are any issues with your little one, you have me as a resource so please reach out at any time and I will be more than happy to help with guidance and support, as usual. I can be reached at . It is important that I share one of the most important ways to improve as an athlete: cross-training. A one-sport athlete is a player that takes on one sport, likely year round, and very rarely participates in other activities other than a friendly game of basketball or gym class. The overuse of the body parts and actions that are demanded of a particular sport put that child at a greater risk of debilitating injury. The solution is simple: cross-train. Take on bodyweight strength training, go for a run, or try yoga once a week (I recommend YouTube with a search for Gaiam Yoga). This will not only provide a mental break but will also provide the variety that great athletes are built on. Over the years, football players have done ballet to benefit strength, balance, focus, and endurance. Runners strength train to create barriers of muscles that support their knees. Speed skaters take on dry-land training to build explosive power and balance for their muscles. The variety makes all the difference. And when they return to their passion sport, they will not only be better prepared physically but will be invigorated and energized to get that ball moving! So what that does that mean as the fall season for RHSC comes to a close and we hang up our outdoor cleats looking towards the cold months ahead? RHSC has a history of coordinating various off-season programs from indoor soccer, technical training, and strength & agility. This winter is no different but only if you speak up. If you are looking forward to additional programs or have ideas on new ones, don't wait. Shout out that you loved what was offered before and we can find ways to help get the kids connected. And, as usual, please reach out for any questions or training guidance you would like. It is my pleasure to search RHSC players, parents, and families. "The only time it is OK to give up is when you are helping someone taller than you"
I think it's important for you all to "meet" me digitally before we meet in person! 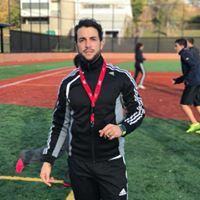 Professionally, I am a strength & conditioning coach, personal trainer and multi-sport coach (soccer, track & field, basketball) in the greater Hartford area. I've also spent the past 34 years as an athlete that was lucky enough to have the right mentors that moved me through baseball, soccer, wrestling, track and basketball. I flourished into a Division 1 soccer player, an Ironman 70.3 triathlete and someone that is obsessed with sports performance. Why am I fit to help in the development of our youth? Many years ago I found an intense joy in working with youth, being a strong example, a mentor and supporter. I find that my energy and positivity matched with my intensity to perform help encourage our youth to reach and exceed limits. Personally, I have a wonderful wife, a beautiful 3 1/2 year old daughter, Layla Rae, and a newborn baby boy, Canyon Reign, that is less than a month old right here in Wethersfield. I put a lot of effort and thought into all corners of my life and I am looking forward to being a part of the Rocky Hill SC community.